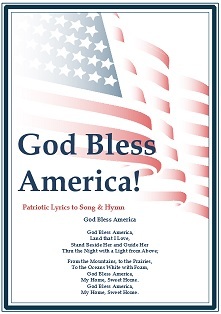 Patriotic Songs for Memorial Day at your church...to download and print. Does your church do a good enough job to honor and recognize their veterans and fallen heroes on Memorial Day? The Patriotic Memorial Day Songs below are not always known to be sung in church but I personally think it is a great idea on Memorial Day to sing them along with your regular church hymns to honor your vets and fallen heroes. Many churches have fallen heroes, and they honor them and use their sacrifice as a shadow of the ultimate sacrifice of Christ. They show honor where honor is due to the fallen and veterans whether they are still active or retired. In many churches this celebration on this holiday does not leave a dry eye in the church. "God Bless America" hymn will undoubtedly be sung in thousands of parades, picnics, services and churches to celebrate Memorial Day. Americans all over the United States will lift up their voices wherever they gather to sing "God Bless America", America the Beautiful", "My Country, Tis of Thee" and many more and stand proud to be a part of the this beautiful country of the United States of America. There are three Patriotic Memorial Day Songs in the download below that you can download and print for your congregation to sing this holiday in your church or personal use wherever you might be. The last Monday in May of every year is when Memorial Day is observed in the United States. Memorial Day also marks the unofficial start of the summer season which is why some people also celebrate by going to the lake to barbeque, fish, swim and much more. Memorial Day was formerly known as Decoration Day and commemorates all men and women who have died in the military for the United States. Many people visit cemeteries and memorials on this holiday. Return to Memorial Day Ideas from Patriotic Songs.